A quintessential part of Afternoon tea, a proper British scone is round, tall, and has an extremely light texture with a crust like exterior. Preheat the over to 425ºF, gas mark 7. Put the flour and baking powder into a large mixing bowl. Add the cubes of butter, keeping all the ingredients as cold as possible. Rub in lightly and quickly with your fingertips until the mixture looks like fine breadcrumbs. Add the sugar, and sultanas. Pour 100ml (31⁄2fl oz) of the milk and all but 2 tablespoons of the beaten egg into the flour mixture. Turn the dough out onto a lightly floured work surface, lightly knead just a few times only until gathered together, then gently roll and pat out to form a rectangle about 3⁄4in deep. Cut out as many rounds as possible from the first rolling with a 2 1⁄2 in cutter (a plain cutter is easier to use than a fluted one) and lay them on the baking sheet, spaced slightly apart. Gather the trimmings, then roll and cut out again. Repeat until you have 10 scones. Mix together the remaining milk and reserved egg, and brush the tops of the scones with the mixture. Bake for about 10 minutes, or until risen and golden. 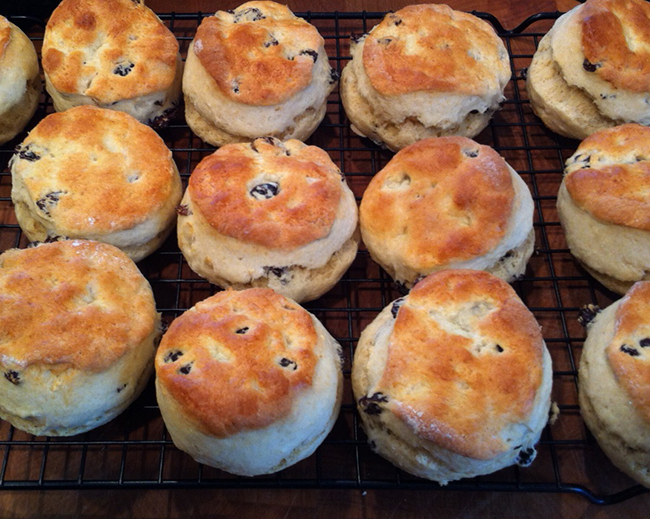 Scones are best eaten on the day you bake them. they also freeze very well, but make sure they are cool before you freeze them.